I sincerely appreciate all of the encouragement of late. I totally agree, one weigh-in doesn’t make a plateau…we’ll see what we find on the 9th! I was just a little concerned and really I believe I needed that zero loss weigh-in to give me the kick I needed to propel me into the right frame of mind for the last 48 pounds. I’ve been on cruise control too long; it’s time to fight! Thank you for being in my corner along the way. I slept in big time today. I can’t remember the last time I slept for eleven hours straight, but I did last night and it felt so good. I must have needed it right? It was a solid sleep, very comfortable, very nice. I have improved the sleep part of this weight loss equation. I’m getting more sleep these days and many times that comes at the price of posting the next day instead of at the end of the day. I hope you don’t mind. There was a time not that long ago where I wouldn’t think of writing and posting the next day, but I’ve learned to not be so crazy fanatical about it. I’ve put it in perspective, and if it means I get to bed earlier, then it’s the best thing. Now don’t get me wrong---Ideally I’ll post the night before or early the next morning—but when I don’t, trust there’s a valid reason that usually has something to do with sleep vs. a busy schedule. I had a wonderful workout today. 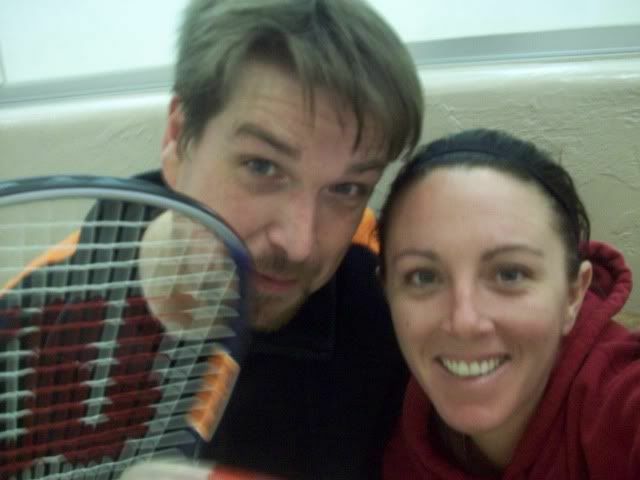 Whitney, a long time (from Day 1) reader who happens to live right across town called and suggested a racquetball workout. Whitney can play with anybody and beat him or her too. I really didn’t have a chance at winning, but I didn’t care. She couldn’t help but beat me three straight games and we had a very nice workout in the process. I’ve written before about Whitney and her weight loss journey. It’s hard to believe now that she was ever up to nearly 200 pounds, but I remember---and so does she. She’s below 135 now and if you ask me, she’s there, but I think she’s working on another 5 pounds. She’s already below the goal she set a when she started, but like we’ve said before: It’s not a number, it’s a feeling. Whitney will know it when she gets there. I’ve worked with Whitney’s mom at Team Radio for years, so I’ve known Whit for quite a while. She also remembers 505 pound Sean very well. Certainly not the Sean that somehow scored eight points in one of those games today, I mean we were moving good! And I have to say, she’s a good Sooner fan too. Whitney and her husband Jim are huge Sooner fans, so you know they had a great time Saturday when the Sooners embarrassed my OSU Cowboys. Whitney made one mention of the game, and then totally dropped the subject. She’s such a good sport! I enjoyed a six inch Subway Black Forest Ham today. I ask for half the cheese they normally use and I load it up with veggies. Even with a thin strip of lite mayo, and I mean thin---I tell them “I want the thinnest strip of lite mayo you’ve ever put on a sandwich,” and that usually makes it just the way I like---and just under 350 calories. It’s filling and good, and completely doable with the calorie budget. No problem at all. I also enjoyed some more leftover turkey breast today. It was a good food day really. Even though I did “invest” 250 calories in coffee creamer. That’s seriously ridiculous. I desperately need to stop that! It’s just a waste of calories---pure and simple. I guess I’m not going to quit coffee anytime soon, but perhaps I should limit my allowable coffee calories to 100. At dinner the other night, after ordering water with lemons, I mentioned how I don’t like spending calories on drinks. A friend of mine quickly reminded me of my fondness of coffee creamer. “Oh yeah, that’s right” got me there. Got me good! If you’re in the USA then I hope you’ve had a wonderful holiday weekend, if you’re outside the USA, I hope you had a wonderful weekend too! This week will be a very busy time for us. We’re moving into our apartment this week and we’re not ready at all! I guess we need to get ready, because it’s here---this is it. Time to pack already! It helps that Irene has already moved, so it’s not quite the chore of a full move, but still…any move is a move, right? I can’t wait to get settled into our new place and new kitchen. I swear, we’re not eating out for a long time once we get in there! I’m looking forward to preparing in bulk and freezing stuff for easy heat and eat convenience. And I can’t even begin to tell you how much I’m looking forward to being able to workout anytime night or day. I honestly think I’ll start working out good in the very early morning. It’s going to be nice my friend! Taken moments after the beating. Just like the bedlam game---I don’t think I had one 3rd down conversion. It was a great workout---and that’s all that counts! Day 440, wow…that looks really nice. I don’t know why that number struck me, but it did. I’m so excited about the challenges that are directly ahead on this road. I’m thrilled at my progress and at the same time, a little uncertain of where I’m headed. These are un-chartered waters. I haven’t been this small since my early teen years, and once we arrive where we’re headed, wow…I haven’t been that small since eleven years old. So, that’s where the uncertainty comes from…the unknown. Oooh, scary! But really, it isn’t scary, it’s exciting and thrilling. The road ahead will be a real education on physical fitness and metabolic rates as we battle for a goal that’s so wonderfully in reach at this juncture. The advice has been pouring in, all of it good and sound, and most of it identical or extremely similar. I should increase calories and work out hard is the common theme. I have to admit, I’m having hang-ups about the ‘increased calories’ part of the plan. I know it must sound silly, but I’ve enjoyed…I mean, really enjoyed 1500 calories a day for so long. I’ve learned to maneuver and adjust my foods to get the most satisfaction out of 1500 calories. For instance---I prepared a monster, and I mean MONsteR egg white omelet last night. I used six egg whites, more leftover turkey, and cheese---and still the calorie count was a very unbelievable 200 calories. I couldn’t finish the thing, it was that big and filling---for 200 calories. If adding calories is something I need to do to pick up the metabolism, then I will get it done. But as silly as it sounds (I honestly can’t believe I’m saying this), I will convince myself that it’s OK. Wow, I’ve really brainwashed myself on the 1500 calorie limit. BUT---we must be flexible enough to tweak our approach from time to time. The body is smart; it catches on after a while. Its job is to survive with what we give it---and it makes it’s own adjustments accordingly. If we don’t keep it guessing, then it’ll adjust itself and we’ll crawl along at a snails pace or have no loss weigh days, or dare I say---a gain come weigh day. I must keep this in mind over the next several weeks of this journey. Today was a wonderful Saturday, oh---except my OSU Cowboys getting embarrassed by the Sooners. That was a hard game to watch. It wasn’t what anybody expected, we were stunned at our watch party, that’s for sure. I didn’t do snacks during the game, instead I sipped a diet soda. I enjoyed some thin crust chicken pizza for lunch before the game, so I was all good. Some friends invited me to dinner tonight. We dined at a nice place—with a menu full of questionable choices---I made it very simple and tasty by ordering a chicken breast sandwich minus the bread and veggies and mayo---basically—just a chicken breast with a baked potato. I added a tablespoon of sour cream and some salt and pepper, and it was sooo good! I added a little Heinz 57 sauce to the chicken, at 15 calories per teaspoon---it’s well worth the flavor! I had 30 calories of that yummy stuff! I always order water with extra lemons, then I squeeze the lemons into the water and add a zero calorie sweetener. It’s nearly free lemonade—calorie wise and monetary wise! It was a nice dinner indeed. I received an update on my dad, and it wasn’t a good one. He’s experiencing some complications as he recovers in the hospital. His intestines and colon are not working properly now---and the doctors are making adjustments as needed. He can’t leave the hospital until everything is working properly. Aunt Beverly called with the news, then I heard from Dad before the night was over. Dad is still optimistic, “just a little setback, no big deal.” He’s got a great attitude. I know he’ll recover nicely. I can’t wait to see him again someday soon. Many challenges are directly ahead. I’ve got to move in the upcoming week. I hate moving! But it must be done, so we’ll do it. I am looking forward to having access to a bowflex, treadmill, elliptical, and various other workout machines anytime, 24 hours a day. That’s just one of the wonderful amenities of our new apartment. So it’s exciting really! Exciting with a twinge of uncertainty. Isn’t change fun! The Friday after Thanksgiving is always strange. It almost feels like a Sunday for me. While I was packing up the leftovers, I noticed that I was leaving the pie—didn’t want it, or did I? Maybe I still don’t trust myself, I don’t know. Perhaps I should buy a half gallon of ice cream and put it in the freezer, that would be the ultimate test. I do trust the changes in me. BUT---I’m always careful, limiting my “exposure” to possible trigger foods. I guess it’s a fear of what I once was. A fear of old habits trying to creep into my routine. If you’ve read this blog, you know that I’ve allowed that to happen to a degree as far as exercise is concerned. I’ve allowed missed workouts in situations I would have never allowed in the first 250 days of this journey. My strong suit has always been my calorie budget and strict adherence of that calorie budget, but the workouts have fallen victim to rationalizations and crafty excuses too many times. Consistency is what has given me the success I’ve enjoyed. Inconsistency has no place on this journey. I fully understand that now is the time to suit up for battle. The easy part is over. We’re 48 pounds from goal and I imagine it will be the toughest 48 pounds I’ve ever lost. It’ll take more effort to lose this last 48 than it took to lose the last 150. So I understand where I am along this road. The casual pace of late and the intoxication of being able to do things I’ve never been able to do has given me a false sense of completeness. We are not complete. We are not at goal. And if we’re going to get there we have to work for it like never before. It’s a tricky mental game I’m playing. It’s easy to be easy on me. I feel great, I look better than I ever have in my entire life, and I feel so in control of my eating habits. I’ve enjoyed an amusement park with my kids and rode everything and anything I wanted. I’ve enjoyed booths for several months now. I’ve driven and fit perfectly into a Corvette. I’ve enjoyed a football game in a packed stadium without worry that I would be crowding the people around me, because I wasn’t. I will be going up for a fun flight in a friend’s small Cessna plane someday soon. I can breathe now. I no longer need a C-PAP machine to sleep. I no longer have serious problems with my right leg. It still swells a little, but never to the point of skin breakage like at 505 pounds. I haven’t had to be “wrapped” in over 8 months. My blood pressure is completely normal without medication. My cholesterol is perfectly incredible. All of the other blood work is great too, except I need to raise my good cholesterol a little bit. By the way, these are not listed in order of importance. Health and well being is by far the greatest thing I’ve accomplished. I had so much to be thankful for yesterday, today, and every day forward. But you see what I mean? With all of these wonderful things…it’s so easy to relax, ease up a little and cruise to victory. I can’t do that. Wednesday’s weigh in showed me that if I don’t make some changes to my approach, it’s going to be a really long last forty-eight. Wow. “The last forty-eight” sounds so wonderful. But I know for sure---It will be a challenge that will require the consistency and no nonsense approach that has brought me this far. And as far as adding calories to poke the metabolism, yes, I plan on doing that too. It’ll be controlled, but still kind of strange to eat more to lose, but it’s a proven technique. I hit the trail today with the spirit that we’re going to kick this into high gear, and I did. I did the quickest 5K I’ve ever completed. I didn’t keep the time, but I jogged, a light jog, but still a jog---for a good part. I was happy with the workout and look forward to pushing myself even harder in the weight room. Leftovers are wonderful by the way! I enjoyed a turkey breast and cheese egg white omelet today that was less than 175 calories. It was fantastic! I shredded the turkey and put it in the frying pan with some zero calorie cooking spray…it gave it a slight crisp, and that was awesome. I used a regular yellow American cheese slice instead of mozzarella. 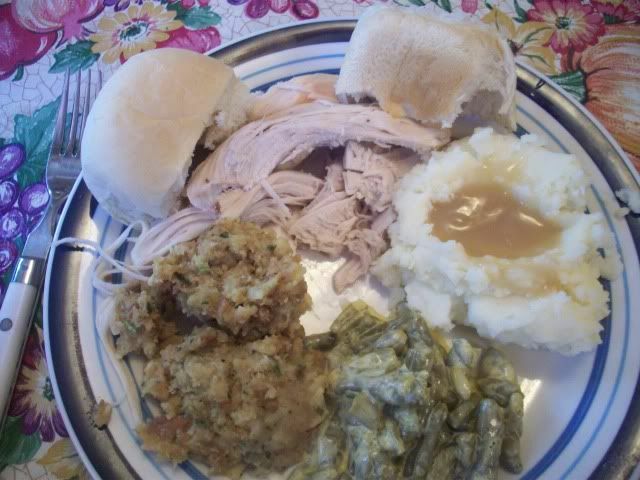 It was a very tasty use of leftover turkey. I’m officially over my silly little tantrum about yesterday’s weigh-in. It happens to everyone eventually, and there are many possible reasons why it happened. The advice and support from everyone has just been incredible. I thought about my feelings over this and I concluded that I needed to be a little more thankful for my blessings. I have good blogger friends that read this blog---good friends who have faced gains at weigh-in, and they usually handle it with grace and an honest common sense approach to the question why and what they plan to do about it. I deserve zero sympathy! How dare I complain about anything along this road so far---It’s been nothing but a blessing. I’m a very fortunate individual. I don’t think my reaction was too bad really---maybe only a few people wanted to slap me, but like I’ve said---My success along this road has spoiled me rotten. I walk into that doctors office every two weeks with a confident swagger, just knowing-expecting and collecting my rewards on the scale. “I’m just here to add a little more to my loss total.” Good for my body and the scale for setting me straight! Now I realize that the game must be on. What does that mean? It means for me to stop casually cruising along and make some deliberate changes to what I’ve been doing. Nothing crazy…just making sure I’m drinking enough water, making sure I’m eating at home more often than out, maybe increase my calories for a couple of weeks, and hit the workouts with the same crazy beautiful consistency that started this whole journey---but maybe try a few different routines. Plateau—shmateau---I got this…keep reading everyday, you’ll see. Today---Thanksgiving Day, the day of the feast! Not long after Courtney and I hit Stillwater, we were at Wal-Mart stocking up for the dinner. Shopping is different now. Our selection process is drastically improved. We don’t overbuy, we read labels, we make educated decisions in the aisles of the store. This is a big change from when we couldn’t care less. It was a free-for-all back then. If it looked good and loaded---oh yeah, it was going in the basket. Some items wouldn’t even make it out of the parking lot unopened. Some, not even out of the store. We started the day with breakfast. I shared a two whole egg sausage and cheese omelet with mom, well worth the 200 calories it cost me. The idea of a good breakfast was to make sure I didn’t “pick” as we cooked. Irene was up early with me and we started working together to get the meal on the table by 11:30am. Irene had to be on the road back by 12:40pm, she had some casino managing to do today at 2pm. We work well together in the kitchen, always have. We know each other well enough to read each other’s mind. I added 1,000 calories to the budget today, just like last year. 2,500 calories is more than enough to enjoy whatever taste of the holiday I wanted. I do love pecan pie, but the calorie value is so repulsive to me, I just refused to enjoy even a sliver. It’s not deprivation if you honestly don’t want it, you know? An eighth-slice piece for 470 calories? Uh, no thank you. I prefer my pie to fall in the 200-250 calorie range. OK, I could have had a 1/16 piece like last year, but again---completely turned off by one of the worst calorie values I’ve encountered---topped only by eggnog. An 8-ounce cup of non-alcoholic eggnog—360 calories…Uh---forget that! Well, at least for today---I wouldn’t buy it last night, sorry fam! We will have a sip or two come Christmas, but seriously I didn’t miss it one bit today---same with the pecan pie. I couldn’t care less. After dinner, we traveled the four blocks over to Aunt Connie’s holiday feast. We were invited for dinner and desert, or just desert. We decided to go over and enjoy desert. Surely I’ve written about Aunt Connie’s reputation as the baker in the family. She’s incredible in the kitchen---and so are her kids, my cousins. Aunt Connie actually went to school for baking and cake decorating---she knows her stuff. Oh boy, does she ever. I was really looking forward to the visit. I haven’t laid eyes on many of these family members since I started losing weight…so I was ready for the onslaught of “wow” reactions. And yes, they came fast and furious. Aunt Connie told me that she hardly recognized me when I walked in---that was cool. Everybody had a shocked look and a compliment ready to go. Isn’t this fun? I thought. They always hoped I would do this once and for all, but like so many of my loved ones, I imagine they weren’t holding their breath---I was so lost for so long, can’t really blame them. I had planned on simply having desert, maybe my second piece of pie for the day…But then I noticed what appeared to be Aunt Connie’s homemade rolls---I’ve got to have one of these, oh my—one taste and I was immediately transported back to my childhood and the monthly family get-togethers. We didn’t need an organized family reunion back then---we just naturally gathered every month. I miss those days, I do. As soon as the roll hit my lips, Dale---Aunt Connie’s oldest, started telling about his smoked ham---and well, it’s ham---and after hearing Dale lovingly describe its preparation, I was committed to trying a bite or two at least. While I was grabbing a bite of the best smoked ham in the world I also noticed stuffed mushrooms. I love mushrooms, and if they’re stuffed with a cream cheese mixture, then---let’s do it! I had two of those little things. April, Aunt Connie’s daughter prepared them, along with an amazing homemade apple pie. I had found my second piece of pie, oh my…the crust---so flakey, so perfect…The apples and cinnamon, the sugar---Oh it was fabulous. I made it a small piece, probably less than the 250 calories I guesstimated, but that’s all right, I had calories to throw around---and I did, and it was good. I discovered something interesting at the store last night. Cool Whip, a holiday desert staple in the Anderson family, has 25 calories for two tablespoons…I knew that already, but what I didn’t know was this: Redi-Whip---you know, the REAL whipped cream in the can---it’s only 15 calories for two tablespoons. We bought the Redi-Whip instead. It was so good. I’m not sure that I saved calories by choosing the Redi-Whip. You see, with Cool Whip---you can’t spray it directly into your mouth like Redi-Whip. Yes---should have made a video of this: Courtney and I took turns doing Redi-Whip shots. But they were quick shots---a couple of tablespoons each---not bad really. I’m such a fun dad. We seriously missed Amber today. She spent Thanksgiving with KL and his family. She called last night to tell me about all the homemade items they were preparing, including an absolutely incredible sounding-homemade German chocolate cake. It was the first Thanksgiving we’ve experienced without her. Did not like that at all. But, we’ll have them for Christmas! Good. Amber will have to prepare that cake all over again! After all of the visiting---we did what most people do. Watch football? No. Do dishes? No. Sleep? Yes! I crawled into my mom’s giant recliner and it didn’t take long to drift away for an hour or so…wait, maybe longer. All I know is---we let the sun and warm temperatures leave us before heading out to the lake for the 2nd Annual Anderson Family Thanksgiving Day 5K---in the dark of the early evening. It was just three of us participating this year--Courtney, me, and Uncle Keith. Keith had said he only wanted to walk the 5K, so we had him go ahead of us in a separate vehicle. Our plan was simple; we would arrive and then jog to catch up with Keith. We ran, then walked…ran some more, and then walked…kept running---and finally I called Keith. “Where are you?” He was on the bridge about 300 yards ahead of us. He kept walking while we ran toward him, finally---after completing nearly a third of the 5K, we caught him. I finished out the rest of the 5K walking briskly and visiting alongside Keith. You know me---I prefer getting lost in my music while working out, but I looked forward to the visit with Keith, so I left the iPod in the vehicle. We couldn’t help but notice how alone we were out there. Boomer Lake is always buzzing with runners, bicyclist, walkers---it sure was busy last year, but we didn’t wait until the cold dark evening last year. We owned the entire lake tonight---having completed over half of the 5K before we crossed another person. We only encountered two other people out there tonight. It was incredible. The air was crisp, the lake was calm, the stars and moon so bright---It was chilly, but I enjoyed it. Afterward, the three of us reminisced about last years Thanksgiving Day 5k---and how beat we felt then, but tonight was different of course. I could have done another 5K right then and there, I’m serious. I didn’t go back in the archives to check---But I’m pretty sure I’ve lost about 170 pounds since last years trek. That’ll make all the difference in the world my friend. It felt so good, so very nice to be able to move so easily. Oh what freedom, it’s freedom pure and simple. Oh…before I forget to mention it…I took a seat on my mom’s porch patio today. Why is that so amazing? Because it was one of those folding lawn chairs with the nylon straps and narrow arms! I’ve avoided these my entire life. These type of chairs were reserved for people of normal weight and width, not me…until now. It was comfortable and---here’s the bonus: I had room to spare on both sides! I sat out there and enjoyed a wonderful conversation with Irene before she left. We both were excited about me fitting so wonderfully in that chair. I fit! So cool, I love it! Courtney and I headed back home with calories to spare. I still had over 600 remaining at that point and really wasn’t too concerned about using them. I decided that a junior size frozen yogurt cone was in order. I had to count it as 200, they made it a little big, even though it’s suppose to be only 2 ounces. They get really confused if you complain about a “too big” cone. In their mind, they’re being generous---just being nice, giving us a little more bang for the buck. I never say anything, OK, I did once…and then realized that they were just being nice---So now, if they make it bigger than it should be…I just count it. And if it’s too big, I’m not opposed to sharing, or simply throwing it away. On the ride back we listened to Nirvana’s “Smells Like Teen Spirit.” I love that song and so does Courtney. I have such a diverse taste in music. Listening to that song sparked a wonderful conversation about Kurt Cobain and his choices---and how incredibly important those choices become in determining our future. Of all the wonderful things we have to be thankful for---and we did give thanks today for many things---I have to say that having two incredibly mature and wonderfully intelligent daughters is at the top of the list. OK, wow---this is an epic post. And I’m not done. Below you’ll find some pics from today, and some “Lost” Before pictures. Thank you to Aunt Kelli for finding them! I can’t believe how huge I was back then. 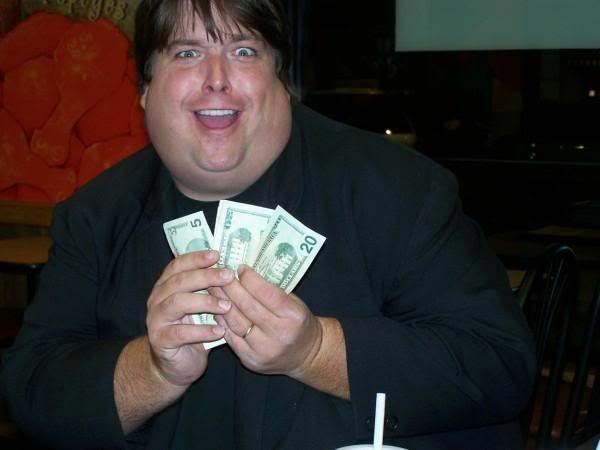 The birthday money face picture is officially one of my favorite before shots…check out that gigantic face. It’s like all my chins merged into one giant super-chin. Wow. Anyway, I’m also including a re-typed food log from today. And you’ll notice I left some (120) on the table. Eating more just to hit the special 2500-calorie limit seemed silly. Oh, I could have done it easily…just didn’t want to. It’s like all of my chins merged into one big Super-Chin. Love this “Lost” before picture. Me acting completely goofy. I know I had mentioned posting videos too---but the only one we made was at the lake, in the dark prior to the 5K, I posted that one to facebook—We’ll have plenty more videos soon, trust me! They warned me that this day would come. They told me that eventually I would hit it, but I just smiled a confident smile and kept on going. Did I think that I was immune to the "P" word? Weigh day after weigh day, every two weeks---another loss, I was so spoiled. The numbers were big at first, then settled into a slower, yet still generous groove. Over the last few months, it's slowed to a steady two to four pounds every two weeks. I guess I thought I could dodge the "P" word, like I was going to be different somehow. Well, trust me friend, I'm not different or special. I stepped onto the scale today and then off, then I stepped back on, then off...then I made sure it was properly set to a zero start and...still, 278. Today was the day. The streak of consecutive weigh days with a loss is officially over. I'm so lucky really, lucky to have lost the first 227 pounds before hitting this wall. Lucky it wasn't a gain, lucky and thankful I am here. I'm 48 pounds from goal and nothing can stop me now. Plateau? Call it what you will. Whatever you call it, I'm going to break it down quickly by changing up the workouts and perhaps, just maybe...increasing the calories for a couple of weeks. Maybe try 1700 for two...just a little extra metabolism booster--coupled with a workout changeup. My body has obviously caught on to my routine, so it's time for a few changes. Ah yes, here we are. Tomorrow is Thanksgiving in America, a holiday where it became fashionable to be stuffed silly. We're not going to do that here. I will do what I did last year, I'll add 1,000 calories--and I'll keep a calorie log along the way. Irene is here at my mom's house too and we're going to cook together in the morning, just like we have for several years. It'll be fun and delicious! We'll be doing a 5K tomorrow afternoon, just like last year, except I plan on jogging as much as I can this time. Last year, I was just happy to make it all the way, now we're really flying! I'm so thankful for the strength and resolve to do what I've done. I'm thankful for good health. I'm thankful for having such wonderful family and friends. I'm thankful for my career. I'm thankful for so many things---and this list doesn't even begin to list them. I'm so wonderfully thankful and happy, and warm...and grateful. I'm a new man, growing and learning along the way, getting to where I'm headed with confidence in the road ahead. What started out as a hurried over-slept morning (usually the precursor for a hectic day), turned into a wonderful, well-balanced day. I like that. Over sleeping for me is 5:10am. If I’m not up by 4:30am, then something has got to give. I jumped up at 5:15am. Oops. My alarm blared the radio station for an hour and I never even realized. I was tired. So what gives? Not the shower---had to do that, quick…uh, the breakfast? Yep. The breakfast suffers. Instead of a hot and delicious, dare I brag—gourmet egg white-mushroom-mozzarella omelet---I grabbed some cranberry applesauce for 60 calories and a bottle of water. This is not enough I thought as I raced for the garage at 5:42am. It takes ten minutes to drive to the studio. I’ve been arriving before 5:30am lately, and I much prefer the casual pace in prepping for the show, it just wasn’t the case today. And so my Tuesday was off and running, literally. My thoughts this morning was with my dad. I left my ringer on during my show waiting for Aunt Beverly to give me updates via phone. She did, and I’m pleasantly relieved to tell you that he’s recovering nicely in ICU. They removed his gall bladder and part of his colon effected by the cancer. 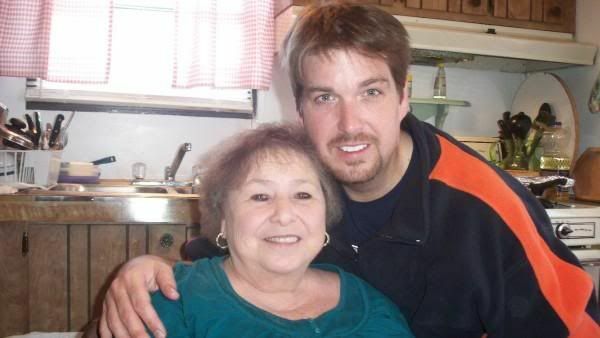 As expected, he’s hurting from the surgery, but Aunt Beverly reported he’s in decent spirits. The doctors were optimistic about his future. And that’s such a beautiful thing to hear. Thank you for your thoughts and prayers. After missing my egg-white omelet this morning, I decided to have it for lunch instead! I ran home and made a big five egg white omelet! Even with an ounce of low fat part skim mozzarella—it was still only 170 calories! We were out of mushrooms, ugh! I love mushrooms, I really do. Fresh is best, not the canned—But I’ll do the canned in a pinch. I really missed that ingredient today. Oh well, it was good and filling—and 12:30pm and I’d consumed less than 300 calories so far. By the time 4pm rolled around, I was hungry! I decided to grab a taco and a bean tostada from a popular fast food place. I’m not mentioning their name because I’m about to speak honestly about their horribleness. Haven’t I learned my lesson here? I’ve written about this before. I don’t understand what has happened. Maybe it’s all in my mind. But I use to absolutely crave this place, heck for; I use to binge at this place! Now, I can’t stand it. My repulsion is so natural and so powerful---I can’t finish the food. I had half a taco and half a bean tostada. I never imagined that this could possibly happen. Is it a change in their food? The recipes? The additives? Or---and I bet this is the answer: Is it a change in me that can’t be reversed? I tried to eat, I tried to tell myself that it was good. I just wasn’t buying it. It was horrible. I hate wasting food, but seriously, I’d rather cook another omelet than eat this rubbish. I should have walked in the grocery store, bought a few chicken breasts, and been happy. Instead this, what was I thinking? I enjoyed a nice nap in the recliner this afternoon. I needed it after the late night last night and the rushed morning. I slept for nearly two hours before waking up refreshed and ready for a great workout. Nothing was stopping me tonight. No excuse, no crafty rationalization, no circumstance---This was going to be a workout to kick my behind. I wanted a real solid ‘night before weigh-day’ workout. Oh my, oh yes…yes it was good. I hit the weight room first and put in a solid upper body routine. I love the way my stomach muscles feel when I pull down the bar on this one machine. Wow, I have abs down there. Oh no, you can’t see them—but I can feel them for sure. Those are abs by golly! And they’re just dying to get out! You’ll have to punch me in the stomach sometime, just warn me first---So I can flex and then you too will feel the six-pack wall underneath the unflattering remnants of a former 505-pound mans belly. I’m curious to see what the next 48 pounds will do for me physically. I’m excited. Oh my, wow---I just realized I’m less than 50 pounds from goal. Why didn’t I realize that before? Very cool, very, very cool. Home stretch baby! Even then, I’ll have work to do in the weight room of course, but 230---that’s the weight—the number I set out to hit, and I will. Although I’ve learned from many of my weight loss blogging friends---that a number doesn’t do it for you, it’s the feeling, not the number that decides where we end up on the scale. We’ll see how it feels at 230. After the weight room I climbed onto a treadmill in the fitness center for a treadmill 5K. It was a walk/jog, and it was wonderful! Oh sure---I thought about stopping after a good two miles---but that’s not the spirit, shoot---I was only a mile away from a 5K---So I stuck it out and claimed victory. I awarded myself a gold medal. I’m kidding. I grabbed my phone and made a couple of videos along the way. I’m walking in one and jogging for the home stretch in another. They’re both posted below. Be careful---the jogging video is very shaky…you could probably get sick watching it. I was going for 3.10 miles---a 5K. I caught some of the Biggest Loser TV show during my 5K. I don’t watch much TV, but when I catch even fifteen minutes of this show, I like it now. I like it because I can totally relate to what they’re going through. NO---not the drill sergeant type workouts eight hours a day---I have no idea what that would be like. But I now understand their emotions concerning how they feel and how they’ve transformed. It’s an intimate understanding that’s so very different than watching it at my heaviest. It’s a very cool show to watch while going through the same kind of transformation—nice stuff. Tomorrow is weigh day. I’m excited about chipping away at this last 48 pounds. I can’t wait for the bi-weekly trip to the doctors office! I’ll be sending out the weigh day update via text, e-mail, facebook, and twitter. Probably a little much, I realize. It’s funny, I was always so ashamed of my weight, now I transmit it around the world every two weeks and wear it proudly. What a wonderful thing. Watch at your own risk! Very shaky---I was just focused on getting to 3.1 miles. Kind of boring really. Finished strong, running actually---it was good. In this video---I’m walking briskly and watching the “Biggest Loser.” I turned the camera toward the mirrored wall to catch my reflection. I absolutely hated that mirror in the beginning, now---I can’t believe it’s me in there. I noticed the most tempting aroma wafting throughout the spacious halls of the Team Radio studios today. Was somebody baking cookies? I have the ability to detect not just the cookies, but also the flavor. I’m like a hound dog with cookies. White chocolate chip macadamia nut, yeah, that’s what I smelled. Never in all my years with the company have I smelled this wonderful aroma. We use the toaster oven in the break room to heat stuff up, but never to bake cookies. Hmmm. Upon further investigation, I discovered that indeed someone, a co-worker and friend, was baking cookies. White chocolate chip macadamia nut cookies. I’m so good. And so are those tasty little cookies. I was offered a cookie and declined. I had already enjoyed lunch, four ounces of turkey breast and a few Funyuns—yes Funyuns (that’s another love of mine), and I didn’t want to mess with guesstimating and “investing” the calories in a cookie. Every cookie is different, but I would imagine these were in the 150 calorie range, nah---I’ll pass. Then Gayle—the above mentioned co-worker and friend, offered me a taste. She actually offered half I think, but I only broke off a nibble. Yep, they’re good all right! You know what’s strange? As much as I love cookies, it’s one thing I haven’t had that much of in the last 435 days. (you ever notice how I always find a way to mention how many days we’re up to?---Oh, stay tuned---I’m sure I’ll be mentioning how much I’ve lost too. I’ve noticed that as well) But really, haven't had a whole lot of cookies so far. I haven’t missed them. I guess it’s just a “calorie value” issue, ya know? I first wrote about my love of cookies on Day 1 of this blog. Here’s an excerpt: Today was day 1. A successful day 1. I even turned down fresh baked Otis Spunkmeyer cookies! Ya see my bank has cookie days every Monday and Friday...so naturally I do all my banking on those days, because even though you're suppose to come inside to get the free cookies, they know me so well, that they will send them through the tube in the drive-through. Today was cookie day, and without my asking, they sent me some cookies with my cash. It was a test! I politely declined the cookies and pushed the button jetting them back to the teller. I explained to a shocked panel of tellers that I was trying to count calories, and although I can have 1500 a day, I couldn't waste 250 on that delicious little cookie. Day 1 and already a test of will power. This is gonna be fun. My dad goes into the VA hospital in Birmingham Alabama for surgery tomorrow morning. They will remove his gall bladder and the cancer in part of his colon. I don’t understand it all, but I refuse to have anything other than a positive attitude about it all. I know he’ll come out stronger. He’s a survivor, spent two tours fighting and surviving Vietnam, he’s going to make it. I talked with him tonight and he’s in good spirits. He’s got a great sense of humor about everything and a real calm about the situation. It’s hard to judge over the phone, but he sounds very optimistic and at peace with the process that he’s starting with this surgery. He also talked about making a trip here. I can’t wait…get ready for pictures when that day comes! Please remember my dad in your prayers and thoughts tomorrow. The holidays are the busy season for advertising. That’s what we do, that’s my job. The radio show is fun, but really---I write and produce radio commercials most of the day. That is fun too, but this time of year can get super busy. Well, now that I’ve laid the groundwork here for a perfect excuse, I’ll tell you. Once again, I failed to workout. I know! I had planned to go to the YMCA---do the weights and a treadmill 5K, but NO…didn’t happen. Why? I was catching up on work that had to get done tonight. What I thought would take about two hours ended up being 4.5 hours. I left the studio just after 11pm. I told myself that I wasn’t going to allow a missed workout tonight. This is not a good example I told myself, but sleep is important too, I rationalized. Wait a second, this isn’t an excuse or a rationalization! This my friend--is a circumstance. Circumstances are different! Time management might be even more important. Wow, here we go again! Whatever makes me feel better about missing. Wow. I’ll pay for it come Wednesday, you know I will. Yes, Wednesday---The day before Thanksgiving, is weigh day. Bring it on. If you don’t count yesterday and today, I’ve had a pretty good workout stretch the last two weeks—including the 10K. It shouldn’t be too bad at all really, we’ll see. Day 434 Visualizing The Puzzle and My Long Reply To The Question "How?" It seemed that everywhere I went today, I ran into someone that was pleasantly shocked by my progress. It’s very fun to be where I am along this road. And you know what? I don’t care how many times I have to answer the question “So how have you done it?” It never gets old, and I respond with equal enthusiasm every time because this is exciting stuff. It’s a new life, a new existence, the old me repackaged and reprogrammed for optimal performance. These are the times and happenings I’ve always dreamed of, with people I’ve known looking and walking right past me because I’m completely unrecognizable from what they remember. I love stopping them and saying, hey how’s it going? And then I wait for them to figure out the solution to the picture puzzle before their very eyes. And although I don’t have all the pieces together just yet, I can see where they fit—I got this! 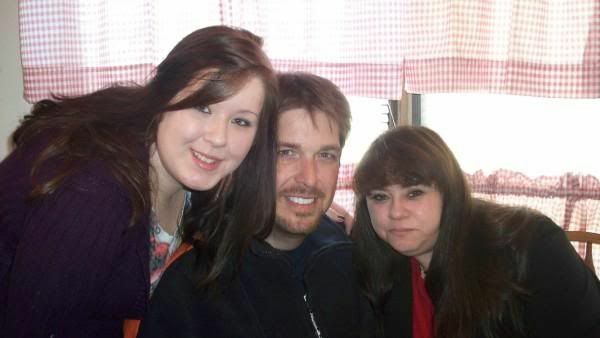 Before Amber returned to school for a short week, we all got together for dinner out. Can we afford this? My goodness, we’re eating out wayyy too much I tell ya! Come Thursday morning, I’ll have forgotten how to cook. But anyway, we all gathered at the Hut, Pizza Hut that is. Pizza Hut can be a minefield of calorie bombs, you have to be very mindful of your approach. The only way to go for me is thin n crispy crust. It’s the least calories of anything they have; well---except salads, and who wants that stuff? Not me! I’ve lost 227 pounds so far without eating a single salad, I’m not starting now. Even though my mom, Irene, and my kids are convinced I’d like ‘em if I gave them a chance. Maybe someday, in the meantime---I’m a meat and potato kind of guy, a pizza loving, French fry eating, nacho craving kind of guy. We ordered the thin crust and a stuffed crust. You can eat two slices of the thin for one slice of the stuffed. As a rule, I try not to eat anything described as “stuffed,” unless it’s stuffed with salad. I’ll eat a salad if it’s stuffed into a taco or stuffed between a hamburger bun. It was a pleasant dinner, all of us together, and feeling good---and maybe a little uneasy about the future. Change always seems hard, even if it’s not, I can make it seem that way. Making things harder than they have to be, wow---I’ve been doing that my entire life. That is, until I started losing weight. It was then I realized that making it hard would surely derail my efforts—so I made it simple. And then clung for dear life as I learned the mental ropes along the way. It’s always hard to see Amber go back. I hate the highway she must travel and we’re a worrying kind of family---so we don’t rest until we get the call that she’s arrived back safe and sound. She’s forgotten to call before…Oh, that’s not a good thing. We freak out in a major way. She certainly knows she’s loved dearly. 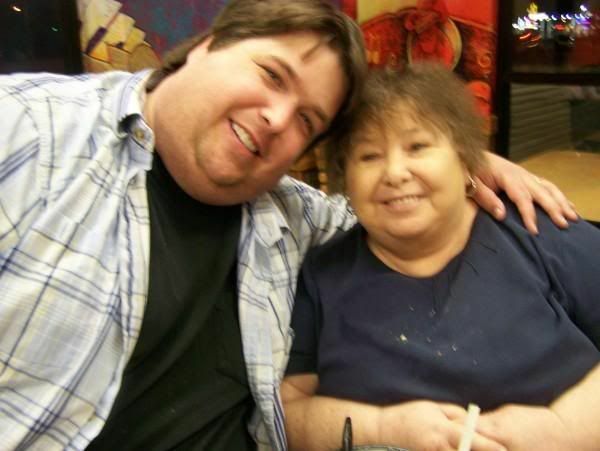 I wish I could hold her hand and guide her all the way through this weight loss journey, but I can’t do that for anyone. I’m here to offer support and guidance, but ultimately these choices can only be made by her for her, me for me, and you for you. I’ll just continue trying to set a positive example. It’s not always a perfect example, that’s for sure, but it’s much better than any other example I’ve ever set. I didn’t workout today. No I didn’t. I’m not proud of that, but I must admit it…not even a quick two-mile walk. My dear mother walked a couple of miles today. You know, my mom, the one that started out barely being able to make it to her mailbox without hurting---yeah, that momma---Two miles! I’m so proud of her. And I’m planning a nice workout for Monday. Perhaps some weight training followed by a treadmill 5K…that would be the thing! A friend who has taken the lead in organizing our marathon relay team for the OKC Memorial Marathon Relay Race in April had a run scheduled for two pm today---I was in the middle of work and then family stuff, so I excused myself. But trust, I’ll be training for my 5K leg hard and heavy. It’ll be much different doing a 5K and realizing that my time affects my entire team---not just me. No time for walking in April, no sir. I can’t wait really, it’ll be fun. My reply: “I took a very simple approach. I ate and continue to eat anything I want as long as I don't exceed 1500 calories a day. I treat my calories like cash. I'm "issued" 1500 to spend each day...how I spend them is up to me. Nothing is off limits, and I mean nothing. But when the 1500 calories is gone, they're gone until the next mornings allotment. So it forces you to make good choices. Or, "good calorie value" choices. The exercise---wow, it was very tough for me at 505 when I started. I could barely walk a quarter mile, it hurt so bad, I was breathing so hard---my chest hurt. So I just did what I could. Slowly and consistently---everyday. The consistency is very important. Everyday. Even when you don't feel like it. (hmm, maybe I should read my own advice--;) If you do this---it gets easier and easier. Soon I was up to a mile, then two, and by Thanksgiving of last year I was able to walk a 5K. Now, a year later and 227 pounds later---I just completed a 10K walk/jog---with jogging being about half of it. It was brutal, but I did it and I made it! It gets easier---but only if you give it a consistent effort. Consistency is key. The food and exercise is really only 20% of this journey. Eating less and exercising more is the means or the "plan" to lose weight---BUT, the mental part is the key to long-term success. You two have got to decide that this is one of the most important things you've ever done. You must set the importance level high. You must be completely honest with yourself at every move. When you are completely honest, it becomes easier to spot the excuses and rationalizations that try to steal this away from you. Don't let them. Develop your motivating thoughts and hold them tight. My number one motivating thought was NOT dying young. I knew that was what I was headed for...an early grave. It seems overdramatic---but you have to protect your journey like it was someone--an intruder or stranger trying to kill you or one of your kids. You have to set the importance level that high. It's much harder to rationalize bad choices when your life is on the line. And it really is. ---Set your importance level to a super high level---Life or death---it must be done now. ---Make this an "Iron Clad Decision"
After a football game Thursday night and a big concert Friday night, I was ready for Saturday to be a little slower pace. Thank goodness it was! Amber is in, so I really looked forward to spending time with her and KL. Amber is really enjoying her special education major at school. She can clearly see that it’s the career she really wants and will enjoy. She’s so perfect for that profession because she’s so compassionate and caring. My brother Shane was mentally challenged, and I believe his wonderful influence on her as a child made a lasting impression that carried over to her high school career as a peer advocate for special needs kids, and now her studies in special education. She’s going to make such a big difference in the lives of so many young people. I’m a proud daddy! Feeling good and full of energy is something that is new to me. I never realized how sluggish I was at 505. Oh, I knew I was always tired and fairly miserable, but the contrast between then and now really makes it clear. I was slowly dying back then. The energy I feel now is such a wonderfully liberating experience. I’m so happy that I grabbed control when I did, and in the fashion I did, because it was getting really bad. My overall physical feeling today is like a whole new world of freedom, limited only by my imagination. It’s beautiful my friend. We have been eating out way too much lately. It doesn’t change my choices, they’re still good, but still---I want to grill and prepare good healthy meals at home. We’re in a transition period at our house, so the kitchen is out of sorts. The grill has been moved to Irene’s new place. I may have to go over and grill a bunch of chicken! I’ll be in my new place within nine days, and you can bet—we’ll be eating at home all the time! The choices are just better at home, you know? You know me; there isn't a restaurant that intimidates me. I've conquered BBQ places, The Olive Garden, every fast food place under the sun, and more. You pick the place and I can get in and out--and be satisfied and under calorie budget, no problem, but still, getting back into the groove of preparing and enjoying good, solid, tasty, and healthy meals at home is something I long for. After a late Friday night, I slept in late and grabbed a roast beef sandwich from Arby’s for lunch/breakfast, brunch we’ll call it. A regular roast beef from Arby’s is only 320 calories. If you remove half the bun it’s even less. I didn’t this time, but I have on many occasions. I had some apple slices ready for a snack later in the day before an early evening dinner with Amber, KL, and Irene at Irene’s new place. We enjoyed some baked chicken wings with a little pasta alfredo. It was good and the conversation was wonderful. Courtney was working and unable to attend. Later, I ended up napping in the recliner. It was a lazy Saturday indeed. We planned a family movie night tonight. It was a little different because we decided against popcorn or any snacks of any kind. Usually we have something, at least some low calorie microwave popcorn, but not tonight. After the pasta alfredo and wings, the old calorie budget was reaching it’s limits. We sipped on zero calorie tea and enjoyed the movie until we all started falling asleep. Isn’t caffeine supposed to keep you awake? Didn’t work that way tonight. Irene conked out first, then me, then Courtney---leaving Amber and KL awake to finish the film. Amber was a little upset that we were all snoozing during family movie time, but she was very nice about it---waking me up and encouraging me to go to bed. I told Irene she should crash here, but she declined and left late. She had work to do at her place. She is incredible at decorating. Anytime we moved to a new place, you could bet that by day 2---everything was in place and on the walls. She has a wonderful way of making any house a home in record time. She’s promised to help me with my apartment. Thank goodness! Otherwise it might look like we just moved in for several weeks afterward. I’m looking forward to Thanksgiving. We have so much to be thankful for this year. Last Thanksgiving this journey was so new and we were just feeling our way forward. Now, armed with a year full of lessons and experience—we’re more ready than ever before for a big holiday. I plan on keeping a food journal that day. I normally don’t, because I’m all about keeping things simple. I don’t want to carry around a notepad and pen everyday. If I can’t accurately keep track of 1500 calories in my head, then chances are it’s more than 1500! But Thanksgiving is different. With so many food choices and the extra 1,000 calories to enjoy---I’ll do it. Plus, I’ll be able to share it with you in this blog. I’ve written about past holidays that completely blew up past weight loss attempts. But just like last year, it’s different now. I’m no longer restraining myself from the desire to overeat. That desire has been replaced with the joy of feeling great---the consequence of good choices over the last 433 days. There's no need to fear a holiday like this. Embrace it with a conscious plan of responsible portions and above all else---enjoying those around us more than the food. I’m comfortably content with eating responsible portions and completely controlling food and my choices instead of the other way around. It’s a very nice place to be mentally. A place I once thought I could never find. I love it here. I hope you understand how I sincerely appreciate your support and readership. I deeply regret ever sharing too personal details of my family’s situation. You know how I feel about honesty and keeping this blog very real. And part of this journey is dealing with whatever life throws your way—or better, whatever circumstance you help create, and staying focused and learning regardless of those circumstances. 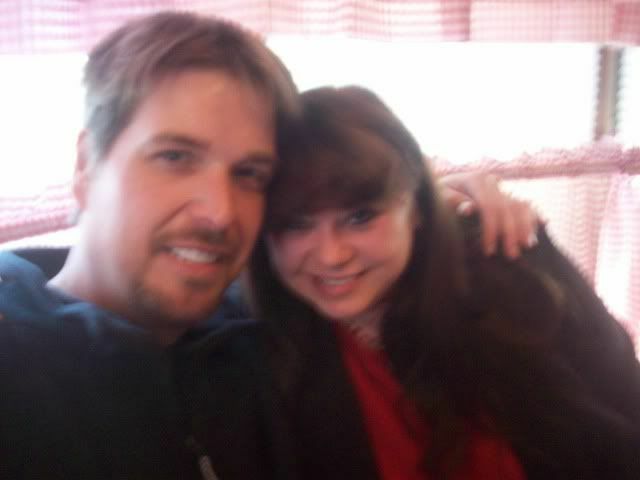 I said it from the very first post that mentioned our marital issue---we have both hurt each other over the years. I sincerely regret and am saddened that a dear reader and follower of this blog has been hurt and upset by all of this. I’ve sent that reader an e-mail in hopes that she’ll accept my apology and continue her very inspiring story here in blogland. I hope she responds. In the meantime, I’ve really reorganized my thinking about everything and here’s what I’ve concluded: This blog is extremely important to me and it will continue in the spirit that has served me so well. It’s a daily account of my transformation from 505 pounds to 230 or whatever feels right…and it will continue to be just that, but---with a more responsible approach with sensitive personal information—especially if it involves anyone other than me. I grabbed a fruit and yogurt parfait and some fresh fruit on the way into work this morning. I also grabbed one for Dave down the hall---He’s the guy that has succeeded me on KLOR mornings. Dave is also the director of the Poncan Theatre---the guy who bought me breakfast after I spent the entire night at the Poncan…remember this from Day 404? : While I was on the air later in the morning, the director of the theatre was kind enough to go buy breakfast for the two of us. I was busy with the broadcast, so he didn’t have a chance to ask me what I wanted. Even though I would have selected a 160 calorie fruit, yogurt, and granola parfait (I love those things! ), I graciously accepted the 720 calorie breakfast he so kindly bought me. I picked at the breakfast in between on-air breaks and ended up throwing half of it away. You know I talk about eating whatever you like and still losing weight, and that’s a key element in my success, but still---I don’t eat 720 calorie breakfast anymore, I just don’t. I don’t like the way it makes me feel. Too heavy, you know what I mean? I can do a 400 calorie breakfast occasionally, but usually I keep breakfast between 200 and 300 calories. Dave loved the fruit and yogurt---and he also brings fruit. It’s going to be fun working down the hall from this guy. He’s a wonderful talent! It was an extremely busy Friday to say the least, we’ve had plenty of those lately for some reason. I didn’t get a chance to get a nap before heading off for the John Conlee concert. If you’re a fan of country music---oh my—check out John’s greatest hits. The show was incredible. I sipped a Diet Coke during the show and some water. After the show I enjoyed some cheese and a few Triscuits. I love Triscuits---they rock! I have to watch myself around those things! After the show, I returned home and spent an hour or so visiting with Amber before bed. I’m so proud of her for a variety of reasons. She’s so mature and smart. And she’s so easy to father. Both of our kids have made parenting so easy for us. We’re so extremely blessed. Good girls indeed. 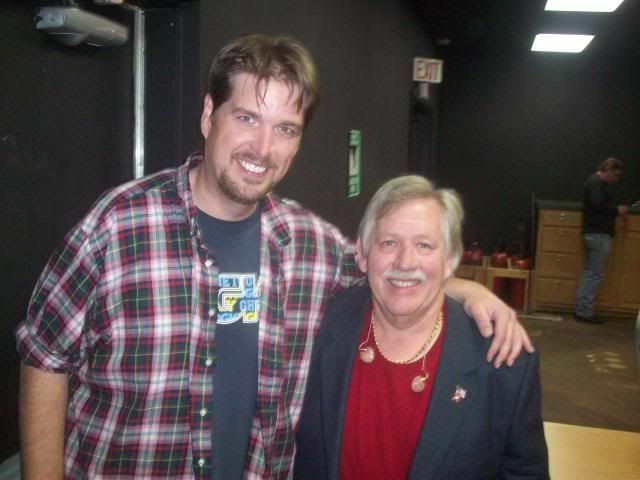 With John Conlee. That over-shirt doesn't do me any favors! As much as I think it does, it really doesn't! Makes me look bigger actually. Actually, I'm not sure if I've waited long enough. I had originally planned to write this Thursday edition between 4:30 and 5:30am this morning (Friday morning). But that would not have been a wise move, as it would have been completely against what I said in the last blog about ending the “divorce talk” in the blog. Sometimes it’s best to wait. I was in no emotional shape to write a fair and respectable post, and I’m not sure I can do it now, but I’ll try. I discovered this morning that someone other than me shared an extremely inaccurate version of our personal events via e-mail with a long-time reader of this blog. After letting this completely consume me all day, I’m finally ready to write Thursday’s blog posting. I must ignore the urge to just come right out and describe in detail every infraction from BOTH sides of the table, but that would just be more needless drama. I’m seriously tired of the drama within these writings. I’m tired of the drama period. Someone suggested yesterday that I had an inflated self-confidence and basically that I must think that I’m just a real looker, full of myself really. This couldn’t be further from the truth. I’m extremely insecure still. Nobody, not even family members, can accurately assume how I feel now. But I can tell you honestly that I am anything but overloaded with confidence. Do I get many compliments these days? Yes. Do I really believe them all? NO. I am more confident, yes, that’s a given…but overly-confident? No, far from it. Full of myself? That’s laughable. When you lose this much weight, the damage left behind in the skin department and psychological department can make you feel as bad or as different as you did at your heaviest. I still feel like a freak---and it’ll be a while and a few future skin removal surgeries and even therapy before that fully changes. The deal is still a good one. I get great health, dimples, and visible cheek-bones…and I can look decent in clothes…but I’m not putting on a bathing suit or taking my shirt off any time soon. Over-confident??—Wow. And to suggest that it has something to do with our current drama---just infuriates me. I have to watch it---Oh how I want to type something else so bad, so inappropriate, so unclassy---although it would be completely accurate, 100%---but I must take the high road. Shoot, I’m slipping off that road just writing what I have so far. What part of “ignore” do I not understand?---I’m being so well mannered. Geez. The following “victim” paragraph applies to weight loss: I am not a victim, I refuse to be one, but some people love playing the part of the victim. Whatever or however the story needs to be told to make us feel better about what we’ve done, that’s what we must believe. If we binge out of our minds, then surely there’s a good reason why. Poor us. The circumstances, either real or imagined, it doesn’t matter---gives us justification for our actions. Actions that we, if we’re honest with ourselves, know are not right and not justifiable. “Self-honesty” isn’t real good friends with “playing the victim.” However---rationalizations are full-blooded relation to the “victim” mindset. Self-honesty, it’s sibling—personal responsibility, and reality---all can work together to provide a real clear path along this road. But without a grasp or even an honest attempt to grab a hold of these things and accept what they are and what they mean---regardless of the pain caused by the realization of the truth---this road becomes impossible. Ralph Marston from www.greatday.com got it right with an entry I’ve re-posted several times and re-read many more. His permission requirement for me to re-post “Set Yourself Free” is to share with you his website and of course to properly credit him. He’s a brilliant writer. What does this do for you? : “Set Yourself Free” by Ralph Marston---"There is no outside force holding you back. You are holding you back and you are blaming it on someone or something else. The way you are able to continue holding yourself back is by maintaining the illusion that you're a victim. Once you realize that illusion, you will naturally and easily move forward. In fact, it is easier to fulfill your best possibilities than it is to avoid them. So let go of the blame and watch the limitations drop away. Certainly there will always be challenges that hold you back. For each challenge provides you with a pathway through which you can move toward fulfillment. It is your very nature to accomplish. Lovingly accept your destiny, and allow that accomplishment to be manifest through you. Set yourself free to follow your purpose. Set yourself free to truly live." This morning was my first morning show on KPNC. I felt like it was my first day on the radio. I was a little nervous, and I don’t get nervous on the air, that stopped years and years ago. But this was new and different. I wasn’t in my comfort zone, this wasn’t “my studio.” I did make it through with minimal damage---and I was stronger from the experience. Proof of that was Friday mornings show, one of the best I’ve had in a long time. I enjoyed lemon marinated apples and a banana during the trainwreck, I mean radio show. I enjoyed a light lunch, just a couple of hundred calories worth of chili, because I was saving as many calories as I could for the football game. College football on a Thursday night just doesn’t seem right. The Cowboys won over Colorado, and that was good, but something just didn’t feel right. The crowd was much smaller than usual, surely because of the Thursday night television date. I really wasn’t prepared food wise for the game. I ended up having what had to have been a 400 calorie hotdog with mustard. The dog alone was 300 if it was 10, but I was starving and desperate for food! I also enjoyed a few tortilla chips with cheese sauce. Hot dogs and nachos---not the best “calorie friendly” options, but I limited my portion and enjoyed them both with confidence. I ran stairs for fifteen minutes during half-time which prompted a sheriffs deputy to ask me if I were ok. “Just trying to get a good workout,” I said and he replied “whatever it takes right?” Yeah…whatever it takes is exactly right. This morning presented one of those food situations where it’s best to eat a small portion of something really loaded. You see, the owner of Team Radio secretly desires to be a gourmet chef. I say this because he occasionally cooks for us, like once or twice a year, and when he does, we all eat together---and it’s really good. And I’m not just saying that because he’s the man who signs my paycheck, the guy really knows how to cook. We had a company meeting scheduled for 10am, complete with his homemade creation dripping with fat and calories. Oh, it was good, real good. The boss made a giant homemade sausage roll. He brought it in on a big baking sheet with a big knife and encouraged us all to enjoy. Well, I had planned on a banana mid-morning---and I still did that, but I also had a sliver of this premium breakfast sausage-cheese-and homemade bread creation. It was incredibly delicious. I probably over estimated my sliver at 150 calories, it was pretty small, but still---I’d rather over estimate than under, right? I guess I could have said “No thank you, I have my banana, I’ll pass,” but it was the boss…oh the pressure! I’m kidding really—I understand that I can eat a sliver of something like this and remain in control. I don’t feel like I cheated one tiny bit, because I didn’t. That’s the beauty of calorie counting. It’s being able to adjust regardless of the situation or who fixed the tasty treat…it’s just living and eating like a normal person. The old Sean would have filled an entire plate and then loaded up again for seconds. The new Sean enjoyed the dish, had a great meeting, and felt good about how he handled this unexpected invasion of fat and calories. I won. I can’t believe we’re a week away from Thanksgiving. My plan will be the same as last year. I’ll add 1,000 calories on Thanksgiving day. It worked perfectly last year. It kept me in control and I was able to enjoy all of the taste and treats of the holiday. Here’s an excerpt from Day 70: I'm really looking forward to Thanksgiving this year. When Thanksgiving would approach on past weight loss attempts I feared it. But my plan is solid. I'll have 1,000 extra calories that day, I'll walk a 5k in the afternoon, then at least another mile later that evening. So bring on the pie! I believe you have to have a plan going into the holidays because it's way too easy to throw your rhythm into a tailspin. Everybody has the cookies and fudge and pies and cakes and wow, it can be a real tight rope, but if you have a plan and stick to it, you'll get through it without falling. I can't wait to write the Thanksgiving Day blog Thursday night. I'll tell you all about it! The plan is solid and simple. I’ll have the same plan this year and no worries! Thanksgiving and Christmas are the only two occasions where I feel adding calories is justified on this journey. These two holidays are so centered around food and special treats, so much so that it’s just expected that we overeat. Have you ever noticed that commercials for antacid products increase around the holidays? Overeating on Thanksgiving especially is just accepted as normal in American culture—So I’ll play along again, but on my own "losing weight everyday" terms! I met Chris Williams for a 5K tonight at the trail. We just missed each other last night, so tonight we coordinated our schedules and pounded out 3.1 miles. We’re making plans to participate in the Oklahoma City Memorial Marathon Relay in April of next year. You get five people on a team and each does a leg ranging from 12K to 5K. My goal is to be able to run, really run an entire 5K leg without stopping. Can I do it by April? Of course! OK, I better check out the Couch To 5K plan. I haven’t been lounging on the couch, so I’m already ahead of the game. I need to be a 5K runner (without stopping) by April---I don’t want to let down the team! A “marathon relay runner” sounds so cool. Chris and I have already talked about doing a marathon someday---the whole thing, both of us. He wants to do it by 40, he’s 36. It doesn’t matter to me when we do it, because it will happen, it will be done someday along this road. I received a comment today from a reader in Canada named Laurie. It turns out that Laurie was the “anonymous” commenter I talked about in last night’s blog. Thank you Laurie for clarifying your position. After reading yours and several other wonderful comments on the topic---I fully realized that I owe Irene a sincere apology. Laurie wrote: Sean, I am sorry if I caused you distress yesterday. It is very hard to be criticized publicly and even worse when it is done anonymously. I have never posted on ANYONES blog before and don't really know what all the profile options mean so anyone who thinks they know who I am, I can assure them they do not. Marriages are complex and many run their course and considering how difficult a breakup can be, you did surprisingly well in saying as little as you did. My point only was to ask you to consider things from Irene's point of view. You got to the public first (and you have a huge following) and basically told us the marriage ending was her fault. That must have really stung her and she has every reason to be upset. I can tell that you still love each other, and everyone makes mistakes, just sometimes it is time to branch out solo. I don't know you or Irene and I can assure you no one knows who I am (I'm from Canada). My cousin Debbie offered: Since this blog is all about honesty, I'll be honest too...I think you could have put the word about the divorce on the table, without placing blame. I don't think that was fair to Irene. No failed marriage is all the fault of one person and that's what it sounded like to me. You made Irene a part of our family many years ago. I have come to love her like my own and that will never change the same as my love for you will never change. You absolutely do need to keep this blog honest for your own success on this journey, but in this particular instance, I think you could have told us all the same thing without stating the cause as Irene's bad choices. We don't need to know the personal details, and you don't share the personal details with us...that is class. But you don't have to tell us anything other than 'for personal and private reasons, we are divorcing'...that would have been enough. Cousin Debbie, Laurie from Canada, and many others in comments and e-mails---Thank you. And you’re absolutely right. I was so worried that someone might get the wrong idea about me, thinking that we were divorcing because of all the weight loss and the new self-image and confidence, that I completely disregarded the feelings of someone I’ve loved and will always love. I never wanted this to happen, but I should have never thrown her under the bus like that---regardless of how this came about. What should have been said was: I love her and she loves me, however, it is with much sadness that I report we are divorcing for personal and private reasons. I’m truly regretful that I didn’t handle it this way. I’ll be talking with Irene privately concerning my error in judgment and the apology she rightly deserves. I’m man enough to admit when I’m wrong. It might take me a while and I might have to listen to the advice and opinions of several people to finally see the reasoning---but when it all becomes clear and I feel like a real inconsiderate jerk (and rightly so)…I do admit it. I was wrong. I think I can honestly say this topic is closed now. Oh sure, it might pop up occasionally, after all—it is a part of our lives right now, and we do plan on spending the holidays together. But I will not mention this topic solely for the purpose of discussion in any form or fashion. I’m really touched by all of the support I’ve received from readers, family, and friends. Thank you again. Staying focused and strong in the face of any emotion, circumstance, or stressful trigger is something that is vital to my success. I simply refuse to allow my changing life to change my mind and my habits back to where they were. I know too much to ever go back. What does that mean? It means that I have a complete understanding of the patterns and behaviors that always kept me morbidly obese. I don’t understand how it all works and why, but I know enough to recognize when these triggers are trying to influence my decisions with food. It cannot, it will not steal this away from me. It’s too important. I’m completely honest with myself now; I can spot an excuse or a rationalization a mile away. Does this mean I don’t make any? No---But I call it like it is, I recognize them immediately. And if any of those sneaky excuses or “make myself feel better” rationalizations try to sneak into my day and negatively influence my decisions with food and exercise, I must squish it like a bug. This is too important. I really wish I had never mentioned anything about our pending divorce. The anonymous comment on yesterday’s blog just grates at me. I can’t be specific about the events and happenings over the last twenty-two years that have led to where we are now. I refuse to say anything more about it. If you have a problem with how I’ve handled the situation, then you obviously do not fully understand the situation. Nor should you. I haven’t handled it as best I could have---but I sincerely tried to be respectful and appropriate, considering how personal this blog has been from Day 1. How could I not say anything about it? I had to explain why we were eventually living separately. This has been a family transformation from the beginning, and now we’re really transforming in a not so ideal way. I couldn’t just conveniently forget to mention that. The reason this blog has always been very personal is simply explained. 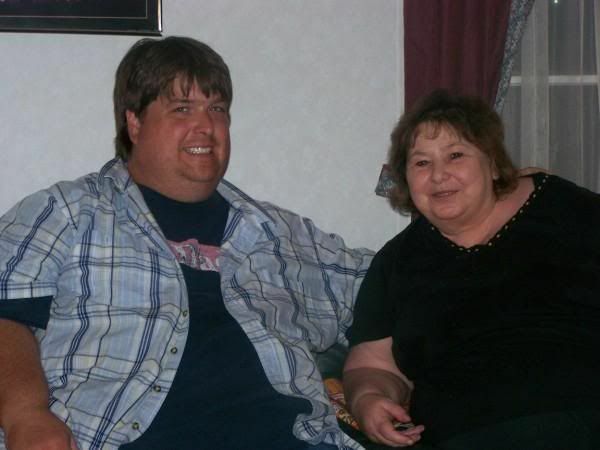 In order to really get to the bottom of the psychological and emotional issues that have kept us a morbidly obese family, I had to put it all out there and sort it out. What if it were simply an “eat less and exercise more” type blog? It would be a temporary success, that’s what. Make no mistake about it---this blog is the real deal. This battle with morbid obesity can be a real monster. Not focusing on every aspect, especially the vitally important personal and emotional aspects would have been pointless---Like fighting a dragon with a toothpick, this monster doesn’t die easily---you have to bring in the big guns and fight from every angle, especially the mental angle. Courtney had to work tonight, so I was solo at the trail for a nice 5K walk. It was a cold one, but at least it wasn’t raining tonight. I put on the iPod and selected shuffle, encouraging my iPod to surprise me. I have no idea why I haven’t discovered the shuffle feature before. I’ve always just built playlist---but shuffle makes sense. If it’s in my iPod, I obviously like it---so why not just give me a random favorite over and over? It was nice. I miss getting lost in my music while working out, I haven’t done that much lately. I needed to tonight, and it was good. I called Courtney and asked about her dinner plans. She already had dinner. She just grabbed a couple of tacos on the way to work. Irene was out with her sisters, so it was me solo. I could have just prepared something at the house, but I hate cooking for one, ya know? So I dined alone at KFC. With the new grilled chicken, it’s become one of my favorite choices for eating out. An entire meal at or under 500 calories is so easy at that place these days. You can also have a 2500 calorie meal at KFC, it’s up to you and your choices. I ordered a grilled breast for 170 calories, a grilled drumstick for 70, an individual mashed potato—no gravy for 110 (I could have had the gravy for an extra 30 calories, but decided against) and an order of kernel corn for 100. No biscuit—no butter---no honey. I ordered water to drink. My meal checked in at 450 calories. No problem! And it was so good. I can’t stand eating alone at a restaurant--I know that. I rarely ever do, it’s awkward, what---no conversation? Wow, the focus is only on the food when we’re alone, wow---I should have brought something to read or messed with my phone. Hmmm. I did ask Courtney and Irene about their dinner plans before going out, they both had plans…so it was what it was…OK. The funniest thing about my KFC visit (yes something was funny about it) was how the guy taking my order was so determined to get me to upgrade. “For two bucks more we’ll give you an extra side, a 32 ounce soda, and some brownie bites.” I said “No thank you.” To which he replied, “These brownie bites are incredible, have you tried them?” Me: “Uh, no, no I haven’t—They look good, but I’ll pass, thank you.” Then I just about blew his mind when I requested “hold the biscuit.” He looked at me like I was the devil. “No biscuit? With butter and honey, man these things are incredible!” I said: “I know they’re good, I’ve had them many times, but not tonight.” And then he must have been required to ask: “you probably don’t want two fried apple pies for a dollar?” I’m pretty sure they don’t want you to word it that way when you’re suggestive selling. It was funny, and it totally made me smile. This guy had no idea the transformation I’m going through---Oh boy, if only he would have known me before---I would have bought everything he suggested. This morning I was publicly offered the KPNC morning show. KPNC is the Team Radio flagship station, so I’m thrilled. KPNC is so rich in history, I can’t wait to dive in. It’s a country music format, and I like all kinds---so it will be a wonderful experience. I’ll sit in on the morning show tomorrow, then Thursday it'll be all me. I’m excited! I’m celebrating my new show Friday night by attending the John Conlee concert just ten minutes down the highway. “Rose Colored Glasses” is one of my favorite songs. Should we go to the lyrics? Uh, better not---once Axle Rose gets done suing me for yesterday’s post, there might not be anything left for Mr. Conlee. John Conlee was once a country music radio personality too, very true! We hope to get a meet and greet! This morning was an interesting one to say the least. Today was the last day of the Sean In The Morning Show on KLOR. I started that show nine years ago, and except for my time away in California, Team Radio has employed me the entire time. That will not change right now. This change in my duties for Team Radio was a mutual decision, despite how it may have sounded on the air. I share this with you the reader, because if you’re a reader in my area and you listen to my show---I can see how this morning’s broadcast could have rubbed you the wrong way. An anonymous reader had this to say after the show this morning: I heard you radio show and I am not happy! Can not believe that you will no longer have your show! I will not be listening anymore that is for sure! What a crummy thing to do to their best dj! Thank you for the compliment, and let me say this: Team Radio has treated me incredibly well and they plan on continuing our employer/employee relationship. The on-air antics were simply a creative way to make the transition. I will have a show with a Team Radio station, I can assure you! That’s all I can really say right now. Let me add this: My replacement, Dave May, is an incredibly talented individual with tons of radio and stage experience. He’s a natural entertainer and one of the most incredibly creative people I know. I can’t think of a better successor for the Sean In The Morning Show. Change is almost never easy huh? I seem to know all about that these days…change…yeah, tough sometimes. I was up in plenty of time this morning, but still didn’t take the time to cook breakfast for myself. I prepared breakfast for Courtney and left it in the microwave while Irene sliced apples for Courtney and me to take with us to work and school. Courtney is now driving, so she doesn’t have to get up with me and go so early. I miss her eating breakfast with me, but I’m happy that she’ll be getting more sleep. Irene is working days now, so she leaves the house early like me. We enjoyed coffee together this morning and talked for a little while before my departure. Before the day ended, we would talk again. I hurriedly grabbed my bag of lemon marinated apple slices and a banana—this would be my breakfast, and headed out the door. I enjoyed the most scrumptious pizza omelet wrap this afternoon. I scrambled some egg whites, only two—or 34 calories worth, used an ounce of mozzarella for 80, some tomato sauce checked in at 25, and the Flat Out flatbread was 90. It was a very filling 229 calorie lunch! It was big and melty and just the way I like it! What a nice low calorie treat. Courtney decided to stay with a friend tonight, leaving Irene and me alone for the evening. We talked about the cold and rainy weather among a few other things and then we decided to get out into it all---in the spirit that started this journey---when the weather didn’t matter, we bundled up and headed for the trail. It was dark, cold, and wet. The rain stung as it hit our faces. We decided on two miles going in, not our best, but enough to get a decent workout in the thirty-seven degree rain. Call me dramatic, whatever—but I couldn’t help but think of the Guns and Roses song “November Rain” as we walked. The lyrics are as chilling as the night: Do you need some time on your own? Do you need some time all alone? Everybody needs some time on their own. Don't you know you need some time all alone? I know it's hard to keep an open heart when even friends seem out to harm you but if you could heal a broken heart wouldn't time be out to charm you? Sometimes I need some time on my own sometimes I need some time all alone everybody needs some time on their own. Don't you know you need some time all alone? And when your fears subside, and shadows still remain, I know that you can love me when there's no one left to blame. So never mind the darkness, we still can find a way 'Cause nothin' lasts forever, even cold November rain. Day 427 The Hardest Workout and Bring On The Booths and Narrow Arm Chairs! The Hardest Workout and Bring On The Booths and Narrow Arm Chairs! There’s no doubt that the 10K road course was easily the hardest workout of the last 427 days. I got up this morning and still felt the burn. It wasn’t like a “hurt” burn, more like a “sore—great workout” burn. There’s a difference I’m sure. I’ve never pushed myself to the point of injury, and that’s a good thing, however—I think I could have pushed myself much more than I have---but I’ve talked about that way too much. I’m just cautious, real cautious. I guess it comes from my fear of dropping over every time I had to exert myself at over 500 pounds. Last night was the Poncan Theatre live broadcast/webcast of my return into the theatre. The last time I did this, it was just me and a flashlight---and my imagination. That’s what made it great radio—my fear, my reactions to noises—Gayle trying to talk me through it---that stuff made for an interesting broadcast. Last night had none of that. I was thrilled to be alongside professional paranormal investigators, but the differences didn’t make the broadcast what I had hoped. I was too afraid to speak up while on the air because I didn’t want to disturb the investigation. I wasn’t afraid because I had a bunch of people there with me during the investigation. The plan for me to stay the remainder of the night was scrapped by me at 2:30am. My thanks to Insight Paranormal Investigations and the Poncan Theatre, Oh, and thank you to the wonderfully kind spirits that inhabit that place! It feels so good to be where I am along this road. This evening I joined Courtney and Irene for dinner out and a movie. At the restaurant we sat in a booth, easily, and at the movie theater I had room to spare in the seat. These are the things that just thrill me! Too many years I just accepted that booths were out and movie seats were going to hurt after a little while of being crammed into one. Not anymore, not at all. Isn’t that incredible? The restaurant was one of our favorite little fast food Mexican places, Taco Bueno, we know all the calorie counts at that place. Like most places, it’s real easy to make bad choices at this place, but we know what’s good and what’s bad, so it’s easy. I enjoyed a 500 calorie dinner that included a “party” taco, a bean and cheese soft taco, and 1/3 of a new cheeseburger taco. We just had to try it! But none of us wanted to spend the calories on it, so we each had a couple of bites, which worked fine.